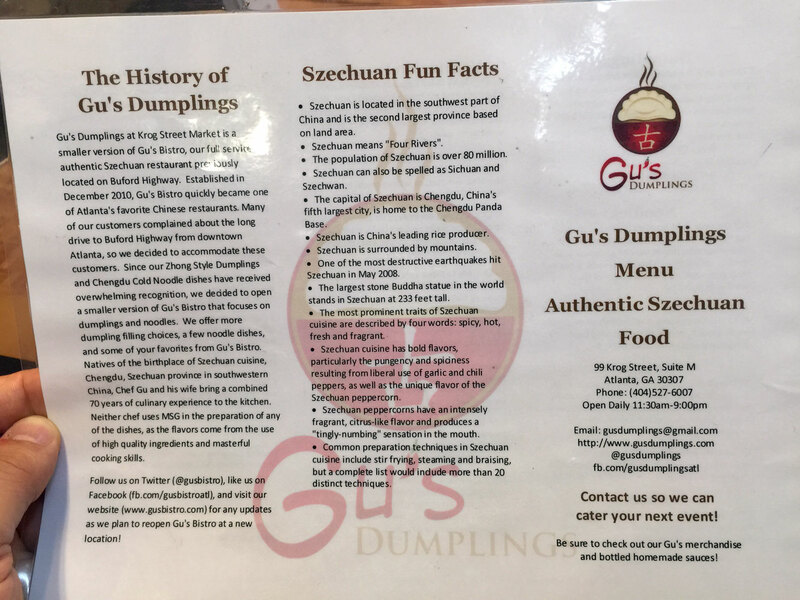 Gu's Dumplings can be found at 99 Krog St NE, Atlanta, GA 30307 in Krog Street Market along the front side opposite where most of the food is located. 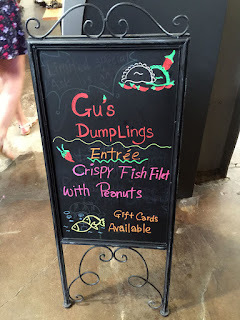 If you haven't been to Krog Street Market, this place is a location for shops and foodie-positioned townie quick bites in an "adult" food court atmosphere. There are also some good to very good restaurants nearby. Since this is on the Atlanta Beltline, Krog St is receiving a lot of visibility and becoming a destination spot for local hipsters and those wanting new experiences. 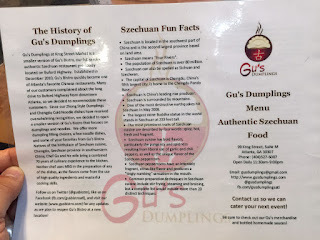 Gu's Dumplings is the brainchild of Chef Gu, formerly of Gu's Bistro on Buford Hwy, considered one of the best and most authentic Szechuan restaurants in Atlanta. Gu permanently closed his restaurant to look for a new location to better serve the many fans of his cooking (it was getting to the 1-2 hour wait in the evenings and with the small kitchen in the original location, he began the search). 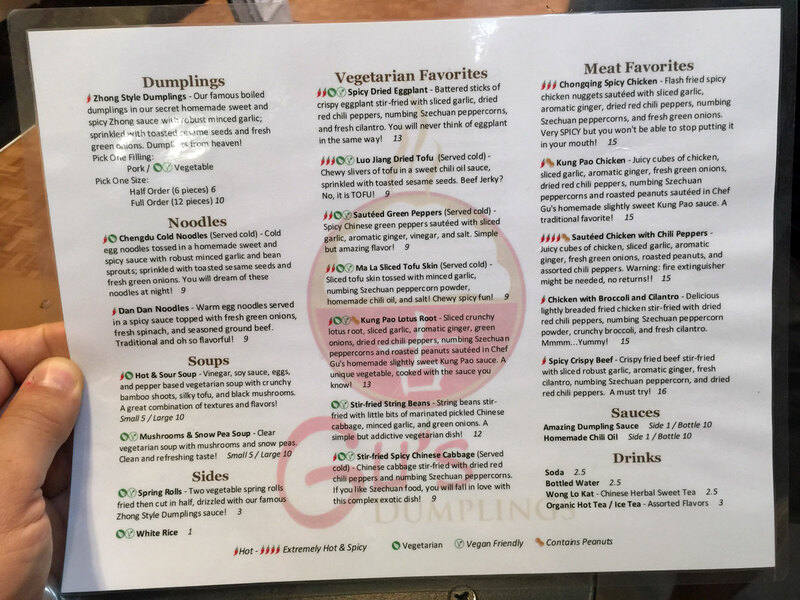 The timing was right to open a new concept and thus Gu's Dumplings was conceived (the intent is still to find a new location for the full restaurant) - the Krog St location provides a way to continue to have a revenue stream and provide a considerably smaller menu of items. 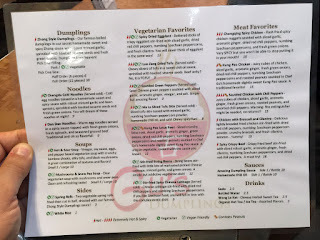 Initially Gu's Dumplings had a very limited menu of about 8-10 items - I'm happy to report that the menu has vastly expanded (still not the variety of the original Bistro but much larger than when the stand opened). 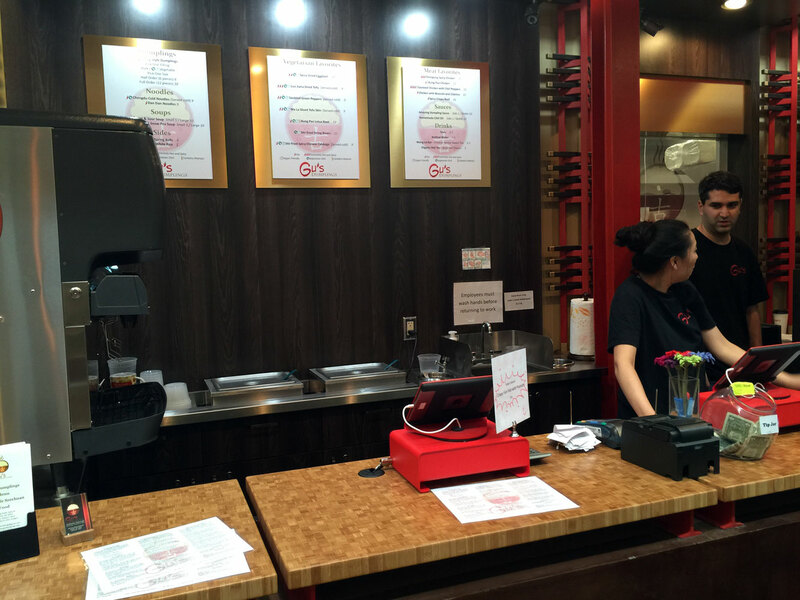 You look over the menu and order at the counter - 10 minutes or so later your order is called and you get fantastic Szechuan eats - you can't do much better than this folks. 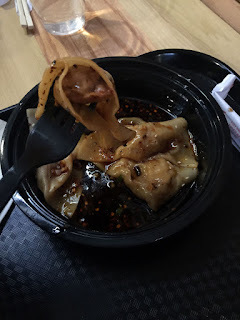 On this occasion we split a half order (6) of the pork Zhong style dumplings - these are boiled in a sweet-and-spicy Zhong sauce that's pleasantly spicy and garlic-y. Quite delicious. I also ordered one of my favorite Gu's Bistro dishes, the Spicy Dried Eggplant. My friend Arvin didn't understand why I got this instead of the meat, but was soon converted. 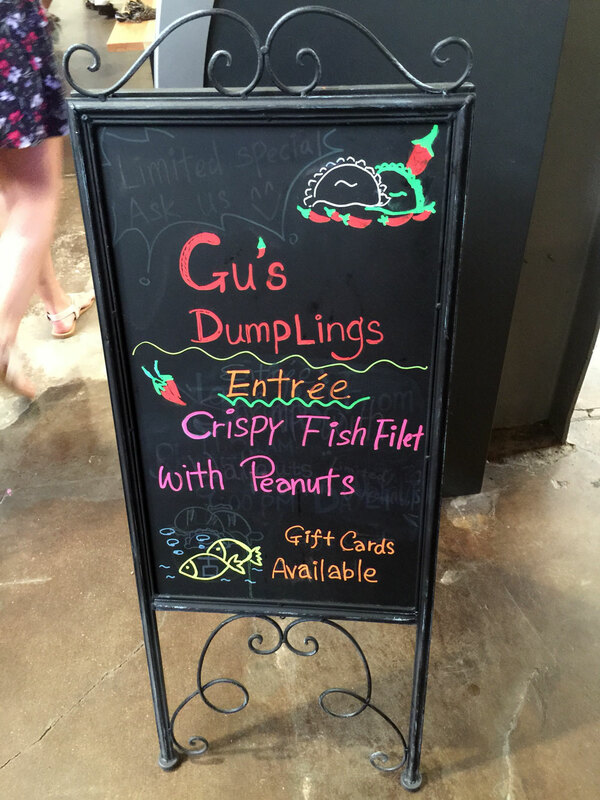 This is one of the best vegetarian dishes in Atlanta, in my humble opinion. 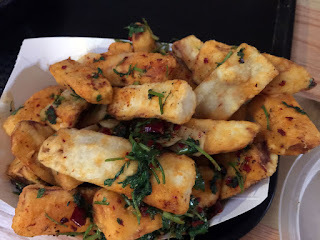 Crispy sticks of battered eggplant stir-fried with fresh sliced garlic, dried red chilis, fresh cilantro and Szechuan peppercorns (these are the famous flower pepper than numbs your mouth!). I didn't realize how much I missed this dish until the huge container was handed to me. 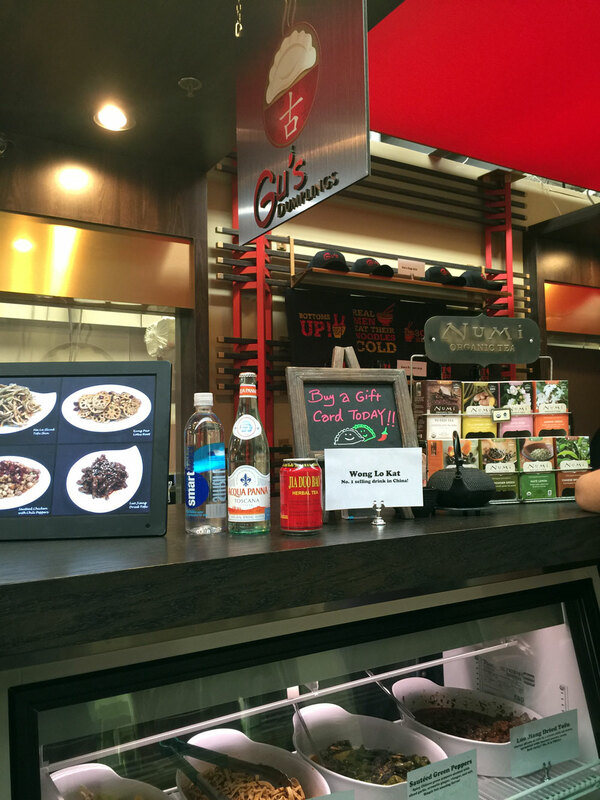 Service was good and reasonably fast - the people behind the counter are very knowledgeable and can answer your questions quickly. 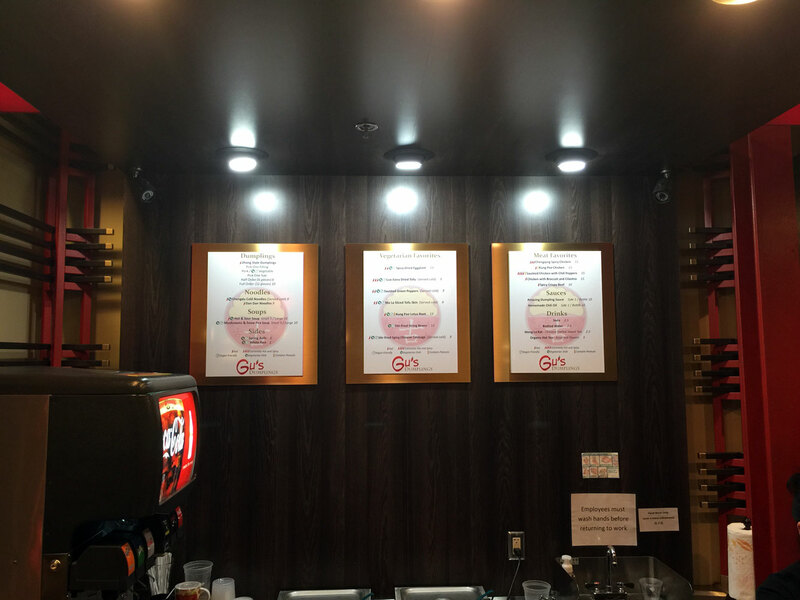 You can look for and may be lucky in finding a table - there's also dispensers for filtered water in the main seating area in front of Hop City - we decided to stand in one of the many bar-height areas along the walls. Go to Hop City and pick up a nice local craft to wash this down - you can thank me later.